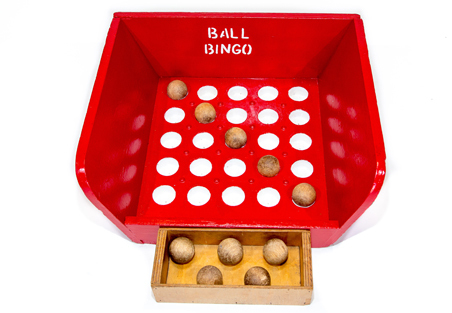 Player is given 10 balls to throw from a distance of 5 feet into the Ball Bingo Tub. Double Winner – first prize: any 2 rows – diagonal, horizontal or vertical, receives large prize. Single Winner – second prize: any 1 row – diagonal, horizontal or vertical, receives medium prize. All other combinations win consolation prize. Player does not re-throw ball if it bounces out of the game, lands between holes or is caught on another ball.